The Heterodox Economics Newsletter has lots of new items—calls for papers, conferences and seminars, jobs for heterodox economists, etc. Of particular interest is the material on the Institutional and Behavioral Economics Section in the American Agricultural Economics Association and on the Post Keynesian Economics Study Group in the UK and its Newsletter. Over the past several months I have collected data on the current state of heterodox economics around the world which I would like to share. First, there are at least 27 different heterodox economics associations around the world—and perhaps more but I am not aware of them. Secondly, working with the membership data of fifteen heterodox organizations, there are 2559 heterodox economists of which 482 are engaged with more than one heterodox organization. And finally, the limited evidence that I have collected indicates that heterodox economists have become more pluralistic with working with different heterodox approaches over the past 15 years (download). Over the next six weeks the HEN will be published irregularly. I will be on holiday in Pakistan for two weeks, then a week in Bogota, Columbia giving lectures on heterodox microeconomics, and then there is the ICAPE Conference in Utah at the beginning of June. After that HEN will return to its regular schedule of production. - Workshop on "Methodological Problems of the Social Sciences"
The Economics Research Unit of the Athens Institute for Education and Research (ATINER) will hold an International Symposium in Athens, Greece, August 6-7, 2007. The registration fee is 250 euro, covering access to all sessions, 2 lunches, coffee breaks and conference material. Special arrangements will be made with local hotels for a limited number of rooms at a special conference rate. In addition, a Greek Night with live music, a one-day cruise to picturesque Greek Islands and a half-day archaeological tour. The drop-dead *deadline* for proposed papers to me *April 20, 2007*. If you want to propose an entire panel, contact me ASAP. I will put together 3 panels with four papers each based on paper proposal I receive. Also. let me know if you are willing to be a discussant or chair of one of these panels. Below are the four preferred topics. Women and the Gulf Coast (or Disasters) (being in New Orleans). Send Randy Albelda a paper title, abstract, and name, institutional affiliation, phone and email randy.albelda@umb.edu including summer phone and e-mail contact info. Please note that the date, time, and location of sessions is assigned by ASSA, not URPE. You should receive word that your paper/session was accepted by mid-June. ASSA will not assign dates and times until much later in the summer. Please note: The SEA meetings this year will run Monday-Wednesday, but we have been able to secure a room so that our sessions can begin on Sunday and end on Tuesday, allowing participants to return home late on Tuesday or on Wednesday. Hotel rooms should be available at the SEA rate for Saturday night. Those proposing papers must also include a one-page abstract as well as an indication of their willingness to serve as a chair or discussant. If you just wish to serve as a chair or discussant, please indicate so in your submission. All information should be returned by May 1, 2007. If you are proposing an entire panel, please have all the contact information for all the participants when you send the materials. Also keep in mind that paid-up SDAE members are given priority for SDAE panels. The calls are for research areas A (methodology), issued by Uskali Mäki, and O (Economy, Society and Territory), issued by Frank Moulaert. Proposals for these two calls (for these two calls only as the general call for the conference and all other research areas has already expired!) should be sent to the Uskali or Frank directly . Their contact details are in the calls, which can accessed directly by clicking on the two links below or if you go on the RA pages on the EAEPE website. The deadline for both calls is May 1st 2007. This year marks the 75th anniversary of Lionel Robbins's Essay on the Nature and Significance of Economic Science. The Department of Economics at LSE and the editors of Economica have decided to mark this anniversary by a conference and a special issue of the journal. The purpose of this conference is both to renew the considerations of Robbins's theme and reflect on the current nature and significance of economic science as well as examine Robbins's own position from a historical perspective. This is to inform you that the IIId International Conference of The Social Capital Foundation will be held on November 15-19, 2007, in Hawaii. We invite you to submit papers for this conference; participation as a discussant or attendant is also encouraged. The deadline is very close to the conference date in order to allow a maximal number of participants to be involved. Please note that we expect abstracts (no full papers) to be submitted. However, participants are advised not to wait until the deadline to submit, the fee being staggered. May we suggest you to inform those members of your networks who could be interested in the conference. We are looking forward to having news from you and to working closely with you for the success of this event. "Services, Innovation and Sustainable Development". Thursday 12 April 17.00, The School of Oriental and African Studies, University of London, Russell Sq. Room G2. Prof Atilio Borón will talk on “The “left-turn” in Latin America: myths and realities”. Prof. Atilio A. Boron (Ph. D., Harvard University, 1976) is Professor of Political Theory at the Univesity of Buenos Aires. During the last nine years he was Executive Secretary of CLACSO, the Latin American Council of Social Sciences. Now he is Director of the Latin American Distance Education Program of the Cultural Center for the Cooperation and Editor of the Spanish Version of the Socialist Register. Author of many books an articles translated into many languages, among which, in English, Empire & Imperialism. A critical reading of Michael Hardt and Tony Negri (London: Zed Books); State, Capitalism and Democracy in Latin America (Boulder: Lynne Rienner); and "The truth about capitalist democracies", Socialist Register 2006. He taught political science at Columbia University, University of California/Los Angeles, MIT and the University of Warwick. Announcement of our forthcoming seminar on ecological economics that we will be celebrating here in Mexico City. Among our guests will be Paul Burkett of Indiana State University whose recent book Marxism and Ecological Economics should become an object of study, discussion and debate in heterodox circles. The Purpose of this unique Global Gathering is to foster serious and immediate Dialog, in the hope of maintaining it on a continuing basis thereafter, between all the extant Paradigms/ World-Views/ Interests / Ideologies that have divided the Human World into disparate, and often feuding, Sectarian Groupings. The Dialog will be, thereby, between the varied Polarities instituted by Geography, Gender, Ideology, Ethnicity, Language, Philosophy, Religion, Culture, and Politics (e.g. East-West, Men-Women, Tradition-Modernity, Conservative-Radical, North-South, etc.). The Object is to locate all possible Areas of Agreement that can serve to foster a World-Wide Affiliation of Peoples who can, while maintaining and respecting Difference, sincerely find Common Cause that will sustain the continued existence of Planetary Life forms under threat today by both Violence and Greed. The Congress will Adopt appropriate Resolutions, both collectively and separately, in all spheres, including Plans for instituting Means, Mechanisms, and Modalities to realize them, in a consilient Spirit of Consensus, and establish the basis for future expansion of the Areas of Mutual Agreement in Ideas, Visions, and Possibilities. Application form and further details are available on our website. Applicants are asked to indicate their background, their Interest in, and rationale for, participation, and their ability to fund it on their own account. Questions and queries may be addressed to participants2007@gmail.com . This is a once in a lifetime opportunity for many to be proximate with some amazing people, aside from being able to directly help address major issues confronting the world today. We look forward to your participation in this event. in the website www.conferencedevelopments.com you will find updated information about the 4th International Conference Developments in Economic Theory and Policy (Bilbao - Spain, July 5-6, 2007) related to: Special Sessions and Invited Speakers, Accomodation and Registration. Is Eurasia’s economic centre of gravity shifting to the East? How serious is the Asian challenge to Europe and the US? Winds of Change: The Impact of Globalization on Europe and Asia. Two hundred outstanding researchers, representatives of international organizations and financial institutions and policy-makers who shape the economic debate in Europe, Asia and North America, representing more than 30 countries will attend the conference. It will be the first event of this scale to be held in the Ukrainian capital. Citizens of the European Union, USA, Canada, Japan, Switzerland and Liechtenstein do not need visas to enter Ukraine. Conference fee $200 conference covers materials, lunch and coffee breaks. Workshop on "Methodological Problems of the Social Sciences"
The Association of Business Historians (ABH) and the Centre for the History of Retailing and Distribution (CHORD) invite participants to their joint conference. For more information, please contact: Laura Ugolini, HAGRI / HLSS, University of Wolverhampton, Room MC233, MC Building, Wolverhampton, WV1 1SB. Le prochain séminaire Thornton de PHARE "monnaie,crédit et liquidité dans l'histoire de la pensée économique" aura lieu le jeudi 5 avril prochain , à 18 h, à la MSE, salle 113. "La transformation des valeurs en prix dans le Treatise on Money et l'analyse de la formation des profits"
What: "Realistic Growth Policy for Our Times: A Conference in Memory of David Gordon"
In remembering David Gordon, the late founder of SCEPA (then CEPA) and New School Professor of Economics, this conference will explore an issue that was important to him, and remains relevant today--the relationship between income distribution and economic growth. The aim is to promote a lively dialogue between scholars focused on labor market regulation, industrial relations and corporate governance, and political and cultural institutions, with scholars of economic growth who see institutions and income distribution as central to their analysis. The hope is to further our understanding of progressive and growth-promoting policies in today's economic climate. This conference is free and open to the public, but reservations are required. E-mail cepa@newschool.edu to reserve a seat. L'économie est un processus institutionnalisé : tel est le consensus qui semble s'établir depuis une quinzaine d'années. Admettre l'importance des institutions pour l'étude de l'économie représente toutefois une rupture avec le courant dominant de la pensée au XXe siècle. Ce livre retrace l'histoire des théories économiques qui composent la grande famille de l'économie institutionnelle. À partir de positions doctrinales et méthodologiques parfois opposées, elles ont toutes tenté de comprendre la nature, le rôle, l'origine et le changement des institutions et apporté une contribution majeure à la réflexion contemporaine. Parmi les grands thèmes de la pensée institutionnaliste figurent les relations entre continuité et changement, le rapport entre comportements individuels et règles sociales, l'impact des institutions sur la dynamique ou les performances de long terme des économies, la place respective du pouvoir et de l'efficacité dans les évolutions historiques. - salle des thèses, deuxième étage ; à gauche en sortant de l’ascenseur. There is no registration fee, but please do advise cambridge@postkeynesian.net if you plan to attend so we can plan afternoon refreshments. Thanks to the generous support of Triodos Bank, we will consider applications by post-graduate students for reimbursement of APEX rail fares within the UK. Meals and accommodation: lunch and dinner are available in Homerton from 12 pm and 6 pm. There is a Travelodge just opposite Homerton College (0870) 191 1601, and a list of local guest-houses and hotels is also available on request. By rail: 1215 from London Kings Cross, take bus #1 or #7 travelling south (Fulbourne, Sawston–every five minutes), get off at third stop directly opposite Homerton College. Alternatively 20 minute walk. Follow signs to “Ibberson Reception” to conference reception area (number 5/6 on campus map see http://www.homerton.cam.ac.uk/pdf/homerton.pdf ), or ask at Porter’s Lodge. By car: parking available by prior arrangement. See website for further directions. Professor George Akerlof, winner of the 2001 Nobel Prize in Economics will deliver the Stamp Memorial Lecture at LSE on Wednesday 25 April. Hearts and Minds: the Ethos of Commercial and Political Advocacy in 20th-Century Britain on April 14, 2007 is a workshop organized by the School of Business and Management, Queen Mary College, London. The annual meeting of the Business History Conference (BHC) takes place May 31 - June 2, 2007 in Cleveland, Ohio at the Weatherhead School of Management of Case Western Reserve University. The theme for the conference is Entrepreneurial Communities. The Centre for the History of Retailing and Distribution, with the Association of Business Historians holds Business Links: Trade, Distribution and Networks on June 29 to 30, 2007 at the University of Wolverhampton, UK. The economic history of the provision and financing of higher education and its reflection in the history of economic thought is an INFER workshop on July 27-29, 2007 at the Technical University of Darmstadt, Germany. The theme of the 11th Annual Conference of the European Business History Association (EBHA) at the University of Geneva, Switzerland from September 13-15, 2007 is International Business, International Organizations, and the Wealth of Nations. Change, Rules and Institutions: Assessing Law and Economics in the Context of Development in London, UK on September 29 & 30, 2007 reassesses the relationship of law to economics in the context of development. Download the program: English French. For further information and for an application form, those interested can write to Marcela Valania at m.m.valania@bham.ac.uk (Please download the further particulars for the School). The deadline for applications is 31 May 2007. Applications are invited from candidates with a specialisation in any area of economics, including macroeconomics, microeconomics, econometrics, economic history, and the history of economic thought. The successful candidate will hold a PhD, or will be close to completion, in a relevant area of economics with achievement of publishable research outcomes and a demonstrated teaching ability. Please address the criteria specified in the relevant position description, which is available on our website. Based in Wollongong, a coastal city south of Sydney (Australia), UOW is rated 5 stars by the Australian Good Universities Guide in the areas of research and educational experience. Applications close 22 April 2007.
to submit your application online & for more information about the position and UOW. York University, Faculty of Arts, Division of Social Science invites applications for two one-year contractually limited appointments in Business and Society at the Assistant Professor level commencing July 1, 2007. The Division is a department within the Faculty of Arts, mandated to provide undergraduate general education, as well as a number of specialized interdisciplinary programs, including Business and Society (BUSO). Information about the BUSO program can be found at http://www.arts.yorku.ca/sosc/buso/. The successful candidate will hold a PhD (or be close to completion) in one of the relevant social sciences or other related field and must demonstrate a strong competence in undergraduate teaching, with a background and interest appropriate for teaching lower and upper level courses within a critical interdisciplinary program. A promise of excellence in research and publication in the field of business and society is preferred. Each candidate will teach the equivalent of three full-year courses including some combination of AS/SOSC 1340 3.0 Introduction to Business and Society, AS/SOSC 2330 9.0 Economics of Law, Policy and Organization, AS/SOSC 3040 6.0 Corporate Social Responsibility, AS/SOSC 4040 6.0 Issues in Business and Society AS/SOSC Alternative Economic Firms and Arrangements and AS/SOSC 4043 6.0 Business Law and Corporate Governance in Comparative Perspective. Dollars & Sense, the 32-year-old progressive economics publisher based in Boston, Mass., seeks a Development and Promotion Coordinator. We publish an 8,000-circulation bimonthly magazine and nine book titles. As part of a team of one other business and three editorial staff, the Development and Promotion Coordinator works closely with a volunteer collective of activists and social scientists committed to social justice and economic democracy. Staff members are automatically members of the D&S collective and attend Thursday evening collective meetings, where editorial and business decisions are made. All staff members participate in planning and carrying out promotion and fundraising activities, and all share a range of administrative and clerical tasks in the office. Fundraising experience; excellent writing, computer, and administrative skills; creativity and enthusiasm; progressive politics; and some professional experience required. Grant writing; magazine promotion; some bookkeeping experience preferred. People of color are strongly encouraged to apply. Position is part-time (30 hours/week) with COLA+3% annual raise, full health benefits, three weeks vacation. Send cover letter and resume by April 15th, 2007 to: Development Coordinator Search, Dollars & Sense, 29 Winter Street, Boston, MA 02108 or email dollars@dollarsandsense.org. Applications will be reviewed as they're received. Dollars & Sense Progressive economics publishing collective in Boston seeks part-time (30-hour/week) DEVELOPMENT/PROMOTION COORDINATOR, responsible for fundraising, magazine promotion. Fundraising experience; excellent writing, computer, and administrative skills; creativity and enthusiasm; progressive politics; and some professional experience required. Grant writing; magazine promotion; some bookkeeping experience preferred. People of color are strongly encouraged to apply. Send cover letter, resume by April 15th to: Dollars & Sense, 29 Winter Street, Boston, MA 02108 or email dollars@dollarsandsense.org. Dollars & Sense, the 32-year-old progressive economics publisher based in Boston, Mass., seeks a Business and Circulation Coordinator. We publish an 8,000-circulation bimonthly magazine and nine book titles. As part of a team of one other business and three editorial staff, the Business and Circulation Coordinator works closely with a volunteer collective of activists and social scientists committed to social justice and economic democracy. Staff members are automatically members of the D&S collective and attend Thursday evening collective meetings, where editorial and business decisions are made. All staff members participate in planning and carrying out promotion and fundraising activities, and all share a range of administrative and clerical tasks in the office. Excellent computer and administrative skills; bookkeeping experience, preferably with Quickbooks; some experience with budgeting and financial management; progressive politics; and some professional experience required. Circulation experience preferred. Requires a careful, detail-oriented person. People of color are strongly encouraged to apply. Position is part-time, approximately 30 hours/week, with COLA+3% annual raise, full health benefits, three weeks vacation. Note: number of hours per week is negotiable, as we would consider narrowing job responsibilities to hire a qualified candidate for fewer hours. Send cover letter and resume by April 15th, 2007 to: Business Coordinator Search, Dollars & Sense, 29 Winter Street, Boston, MA 02108 or email dollars@dollarsandsense.org. Applications will be reviewed as they're received. We are seeking to fill two posts starting September 2007 or earlier. Candidates for both posts will be expected to make a distinctive contribution to the department's research profile and to contribute to the development and delivery of the department's teaching programmes at both the undergraduate and postgraduate levels. We are interested in receiving applications both from new entrants to the profession, with evidence of potential for excellence in teaching and research, and those that have a proven track record. All candidates will have completed a PhD in an appropriate field by the time of appointment and will have clear potential for and demonstrable plans for high quality research leading to publication in reputable academic journals. For appointment beyond Lecturer A level, candidates will have a strong publication record, appropriate to the rank for which they are applying, in addition to clear plans for future research. Applications are sought from candidates in all fields of research but some preference will be given to candidates who are able and willing to complement the teaching needs of our ongoing programmes. We offer a comprehensive package of in-house staff training and development, and benefits that include a final salary pension scheme. Informal enquiries may be directed to Saqib Jafarey, Recruitment Committee, Department of Economics at s.s.jafarey@city.ac.uk. Auckland University of Technology (AUT University) Business School has a reputation as a leading provider of innovative undergraduate and postgraduate business education, with strong links to business, employers and professional bodies. The School has over 6000 students and 210 academic staff and our degree courses include a very successful Bachelor of Business, Master’s degrees (by research and course-work), MBA, and a growing PhD programme. The Department of Economics invites applications for the position of CHIEF ACADEMIC ADVISOR. Duties: The Chief Academic Advisor provides and manages a wide range of undergraduate services for the Department including academic advising, course registration procedures and scheduling, internships, and undergraduate and alumni/ae events and activities. Advisor also supervises undergraduate tutors/peer advisors. Approximately 75% of Advisor’s time is devoted to these duties. Advisor teaches one undergraduate economics course per year (25% of time). Qualifications: Ability to communicate well with undergraduates and excellent organizational and administrative skills. MA or PhD in Economics or a related field. Two to four years experience in higher education environment (teaching and/or academic advising preferred); excellent problem-solving skills, which may involve sensitive academic or administrative problems and interactions with students, parents, faculty, and staff from diverse backgrounds; ability to work independently and collaboratively; excellent computer skills, including knowledge of Excel and, ideally, SPIRE; ability to maintain good records. Hiring Salary Range: $48,000-$50,000. Normal Starting Salary: $48,000. Starting date of appointment: negotiable. Initial appointment is for two one-year periods, with the possibility of renewal beyond two years. Send cover letter, resume, transcripts, three letters of recommendation, and statement of advising philosophy, by April 20, 2007, the priority consideration date. Search will continue until the position is filled. Send materials to: Diane Flaherty, Chair, Department of Economics, University of Massachusetts, 200 Hicks Way, Amherst, MA 01003-9277. Florida International University was founded in 1972 and is Miami’s only public research university. Currently FIU has 38,000 students and graduates the most Hispanics of any university in the country. Its 21 colleges and schools offer more than 200 bachelors, masters and doctoral programs. FIU has also been classified by the Carnegie Foundation for the Advancement of Teaching as a “High Research Activity.” This year FIU was authorized to establish a medical school, which will open in 2009. FIU’s College of Law recently received accreditation in the fastest time allowed by the American Bar Association. We seek candidates interested in working with us to meet the needs of an increasingly diverse, multicultural, technology-driven society. All teaching programs in the College are accredited by NCATE. The College is comprised of four academic departments housing 60 programs at the undergraduate, masters, specialist and doctoral levels. Florida International University announces one permanent, full-time faculty position (possible tenure earning status to begin August 1, 2007. The CLR&S offers an undergraduate Labor Studies Concentration within a Liberal Studies program; two undergraduate Labor Studies Certificates; an under graduate certificate in Vocational Education, a graduate certificate in Conflict Resolution and Consensus Building; conducts sponsored and non-sponsored research and training; and offers a variety of non-credit programs. Salary: Negotiable. Salary will be competitive and commensurate with qualifications and experience. Responsibilities: We are seeking an individual to write and secure research and/or training grants who will enhance and increase the funded research/training efforts of the Center as well as contribute to the undergraduate, graduate and non-credit teaching program and general mission of the College and the Center. globalization and the changing nature of work; immigration, ethnicity and worker rights; workplace health and safety; worker literacy within changing technologies. In addition to the specified areas, applicant must have a demonstrated interest in working with a diverse labor community. Good interpersonal skills required. Heinrich Bortis has written a longish essay/manuscript on “Eastern Civilisation and the Breakthrough to Modernity in the West.” The manuscript attempts to bring together Post Keynesian-heterodox economics with the older traditions of political ethics—see the link. You can contact Heinrich at heinrich.bortis@unifr.ch. U.S. President Bush is trying to pass trade bills with Panama, Peru, Colombia, and South Korea. Unfortunately, these treaties fall far short of a Congressional mandate stating that U.S. trade bills must have significant environmental provisions. The new agreements backpedal on effective environmental cooperation and funding precedents that were set under NAFTA. JUST REMEMBER THE ICAPE CONFERENCE, JUNE 1-3, 2007 AT UTAH. IT IS GOING TO BE A BIG ONE!!! Program and registration information will be posted as it becomes available. ( is now available online at informaworld (http://www.informaworld.com). Volume 21 Issue 1 is now available online at informaworld (http://www.informaworld.com). Volume 50 Number 2 / March-April 2007 of Challenge is now available at http://mesharpe.metapress.com. The Post-Washington Consensus: Brand New Agenda or Old Wine in a New Bottle? The Iranian Oil Bourse: A Threat to Dollar Supremacy? - Who Will Pay for this Puny Defense Budget? Chandos Publishing is pleased to announce the launch of a major new series of books entitled Asian Studies: Contemporary Issues and Trends. Asia has clearly undergone some major transformations in recent years and books in the Series will examine this transformation from a number of perspectives: economic, management, social, political and cultural. We are particularly interested in books which focus on business and management issues. Importantly, the Series will examine both current developments and possible future trends. The Series is aimed at an international market of academics and professionals working in the area and have been specially commissioned from leading authors. The objective is to provide the reader with an authoritative view of current thinking. Under a great cover of a Duncan Grant portrait of Keynes, only just purchased by the Charleston Trust, Geoff Tily argues that Keynes was primarily concerned with monetary policy, not fiscal policy. Viewed as a coherent whole, Keynes's work was concerned with the appropriate technique and infrastructure for the management of money at low rates of interest. More specifically, his rejection of the gold standard led ultimately to his proposal for an international clearing union to support domestic debt-management policies aimed at cheap money. His ideas became reality: with the start of the Great Depression, governments across the world began a short-lived era of the deliberate management of money. While many others have argued that 'Keynesian' economics is a misrepresentation of Keynes's theory, Tily argues that 'Keynesian' economics also permitted a gross misrepresentation of his economic policies. 'Keynesian' economics was a different theory, opposed, and indeed rival, to Keynes's work. 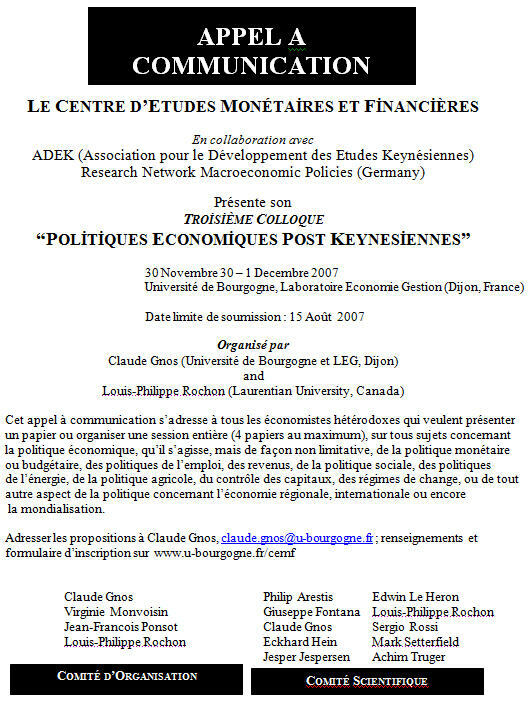 With the policy perspective restored, an alternative presentation of Keynes's economics, based on post-Keynesian economics, is developed. In his new book, The United States Since 1980 (Cambridge University Press), economist Dean Baker describes the sharp right turn the United States has taken since Ronald Reagan became president in 1980. Baker explains how Reagan's policies were a break from both the policies pursued by prior administrations and those pursued in other wealthy countries. They had the effect of redistributing both before- and after-tax income upward, so that the bulk of the economic gains over the last quarter century were directed to a small segment of the population. The author's analysis explains how both political parties have largely come to accept the main tenets of Reaganism, putting the United States on an unsustainable path that is at odds with the rest of the world. Dean Baker is co-director of the Center for Economic and Policy Research in Washington, DC. He is the author of Social Security: The Phony Crisis (with Mark Weisbrot); The Benefits of Full Employment (with Jared Bernstein); Getting Prices Right: The Battle Over the Consumer Price Index; and The Conservative Nanny State: How the Wealthy Use the Government to Stay Rich and Get Richer. Baker is a frequent guest on TV and radio programs across the country. His blog, Beat the Press, features commentary on economic reporting. He received his Ph.D. in economics from the University of Michigan. European Network on Industrial Policy (EUNIP)/University of Limerick (UL) PhD Scholarship in Industrial Economics/Policy Evaluation. Welcome to the Institutional and Behavioral Economics Section (IBES) of the American Agricultural Economics Association. 2006 Long Beach Meeting, July 23-26, "Envisioning the Future"
The IBES Track can be found by searching for "Behavioral" and "IBES" in the AAEA Program. See pictures of several presenters and participants at the 2006 meeting. The annual Business Meeting was held on July 23, 2-4 p.m. Issues raised by Chair Stern to stir thinking about matters to be addressed at this meeting, and in keeping with the spirit of the overall theme for the AAEA meeting, included: What is the future of the institutional and behavioral economics (IBE) approach? What issues do we need to be addressing in the future? What can we do as a Section to make a better future? Where are the present and likely future frontiers in research, teaching and extension using the IBE approach? What other questions do we need to address in envisioning the future? The meeting was well attended, with lively discussion. See 2006 Meeting Agenda. Minutes will be posted soon. IBES Track for 2005 included 4-organized symposia, 2 (plus 1-subject area)-selected paper sessions (for the first time, organized by the IBES Section, due to the IBES initiative asking for Sections to be enabled to organize their own selected paper sessions), and 1-free session. The Business meeting was held on July 25 (See 2005 Minutes). See the 2005 Report to the AAEA Board. Business meeting was held on Monday, August 2, at 5:30-6:30 p.m. Main outcome: A plan to move forward with the IBES Track for the 2005 AAEA meeting in Providence, Rhode Island. A call for proposals will be sent in mid-August: Watch your e-mail for it! See 2004 Minutes. 2004 Framing (outline regarding codification of IBES, what we are about). 2004 Report to the AAEA Board. 2004 Election (report on the IBES election process). To e-mail members of the IBES listserv, send your message to ibes@aaealist.org. We are pleased to announce a new organization of progressive economists working on environmental issues: The Center for the Applied Study of Economics and the Environment (CASE&E). We are economists troubled by environmental degradation and social injustice, by the wide and growing inequality of wealth and income in America and in the world, and by the harmful impacts of the globalized economy on the natural ecosystems that support human activity. In order to change what is wrong with the economy, we must change what is wrong with economics as it is currently taught and practiced. CASE&E promotes a vision of an engaged and realistic economics, in which an understanding of social equity and environmental protection cannot be separated. We invite you to read our statement, Real People, Real Environments, and Realistic Economics, which outlines our critique of conventional economics and why a new progressive economics of the environment is necessary. We also encourage you to check out our online Green Economist Directory of economists willing to work with environmental organizations on either a paid or pro-bono basis. Please consider adding your name to the directory. Adding your name is a great way for you to connect with the real world policy issues going on in your community and it doesn’t commit you to anything. Our statement and the directory, as well as information regarding our other projects and initiatives, can be found on our website: www.case-and-e.org. Membership of the AHE runs for the year beginning January 1st to December 31st. Free membership is automatically conferred on those who paid for registration to the 2006 AHE annual conference; their membership expires in December 2007 unless they register for the 2007 conference which automatically triggers membership for the year beginning January 2008. This week's policy brief is titled "Abandoning America: Corporate Foreign Direct Investment"
Please feel free to share it with others who may be interested in this subject. Economists for Peace and Security, formerly ECAAR, works to inform social scientists, citizens, journalists and policy-makers worldwide about the full costs of war and conflict, and to propose feasible alternative approaches to building international security. paper presented January 5 at AEA 2007, Chicago. In October 2006 they released an update to that study, finding that the costs have risen even faster than they predicted, and their projection is now firmly on the $2 trillion-plus side. Joseph Stiglitz and Linda Bilmes released a paper at an EPS session in January 2006, detailing their study and projection of the costs of the war in Iraq to the US economy. Their prediction at that time was that the total costs (if the US pulls out by 2010) would be between 1.2 and 2 trillion dollars. Who Will Pay for This Puny Defense Budget? Regular bloggers include several of Canada’s leading progressive economic commentators. Guest bloggers add to the range of opinion presented. The blog is “hosted” by Marc Lee of the Canadian Centre for Policy Alternatives (who is also the newly-elected chairperson of the PEF). Postings include both quick-response commentary on ongoing economic developments and economic policy debates, as well as more lasting commentaries on the economy and economics. Published comments are welcomed on all postings (moderated for politeness). And there is a detailed archive and subject index, which makes the blog very useful for research and teaching purposes. Anyone with an interest in Canadian economic debates should check it out regularly. For those heterodox economists in the United States—in case you have missed the discussion regarding tenure by freakonomics and company that appeared in the recent Chronicle of Higher Educations (which is similar to the Times Higher Education Supplement), see below. My comments on the debate are as follows: In the UK at the new universities where I worked in the 1990s there was no tenure as such. Rather the union oversaw working conditions so that no one could be arbitrarily fired/dismissed. So with union backed working rules, tenure was not needed. And a similar policy held at the old universities. However, such protection on the job does not exist at US colleges and universities—tenure takes its place. I guess that Levitt has never really experienced authoritarianism in the work place where the department head can bully and fire at will (or almost at will). The only kind of person who would want to strip American workers/professors of protection on the job is a person who would like to engage in bullying, sexual harassment, and other similar activities but is unable to do so easily because of tenure. Tenure is not only about protecting those with unorthodox ideas—it is also about providing protection on the job. The ever-simmering question of whether the tenure system should be reformed recently lit up the blogosphere, ignited by an online essay from the (tenured) professor Steven D. Levitt, co-author of the publishing phenomenon Freakonomics: A Rogue Economist Explores the Hidden Side of Everything and the popular blog Freakonomics. When Levitt posted "Let's Just Get Rid of Tenure (Including Mine)" this month, proposing an end to tenure in economics, discussion erupted on his own blog and others. Steven D. Levitt, University of Chicago: If there was ever a time when it made sense for economics professors to be given tenure, that time has surely passed. The same is likely true of other university disciplines, and probably even more true for high-school and elementary-school teachers. D.A. Jeremy Telman, Valparaiso Law School: I'm puzzled as to why Levitt thinks that "really good people" will demand only "very small salary increases" to compensate for the lack of tenure. Tenure is one of the main advantages that draws people into the academy who might otherwise make multiples of academic salaries in the private sector.